Improve the job placement rate of our graduates within their fields of study. Improve the skills of the direct support workforce and other related professionals in our region. An inherent value within our community achieved through the lives of the students and employers we serve. Dynamic relationships with employers, secondary schools and other community organizations. A welcoming environment open to the community as a whole. 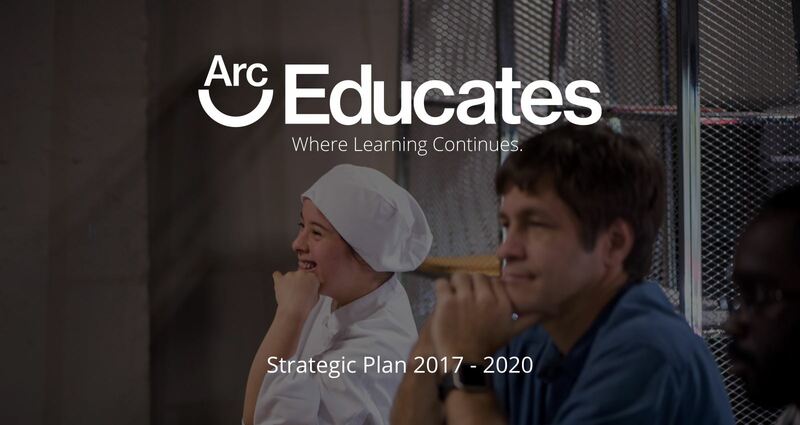 This Strategic plan seeks to capitalize on Arc Educates potential for growth through the continued enhancement of our brand and community access. By focusing on innovation, collaborations and improved reporting and metrics, we will position ourselves as a regional leader in education and professional development. Overall success of this plan requires not only a transformation within the school itself but necessitates community-wide support for our transformation. It will help us track our success, report back to the community and keep us focused on ensuring that our students have the highest-quality learning experience possible. This plan sets a new standard of excellence for educating the community. The plan will help us track our success, report back to the community and keep us focused on ensuring that our students have the highest-quality learning experience possible. Click on image below to review our 3 Year Strategic Plan and supporting documentation.